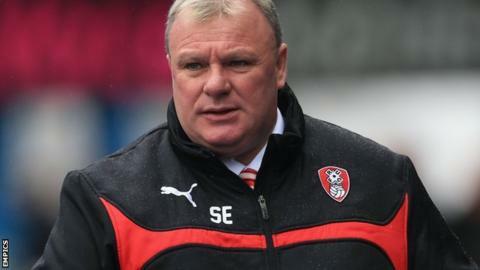 Tuesday's game against Reading will be the biggest in Rotherham's recent history, according to boss Steve Evans. If the Millers win at the New York Stadium they will be secure their place in the Championship, while Millwall and Wigan will be condemned to League One. Rotherham were deducted three points last week for fielding an ineligible player in the win over Brighton. "This is the biggest game the stadium has hosted in its short lifetime," Evans told BBC Radio Sheffield. "It's a big opportunity to secure our Championship status and we need to produce a big performance because I have nothing but respect for them." The Millers were in League Two when they moved into the New York Stadium for the 2012-13 season and earned back-to-back promotions to the Championship. But Evans believes surviving in the second tier would top the promotions. "We said three years ago we would get out of League Two, we said two years ago that we would get up through League One and we said last year we'd stay in the Championship," he said. "This is the biggest fight and the biggest task and it would be the biggest achievement. "When you see the quality of teams that have come here on a bi-weekly basis, I think our supporters deserve to see that type of opposition. "The more you look at who could be in the Championship next season the more exciting it gets but we have to earn that right."